Tipp is Featured Performer on "Night at the Japanese Movies"
"Night at the Japanese Movies,” sponsored by Pitt’s Japanese Nationality Room, will feature Department of Music doctoral candidate Devon Tipp in a performance on shakuhachi along with a talk on his summer experiences in Japan. 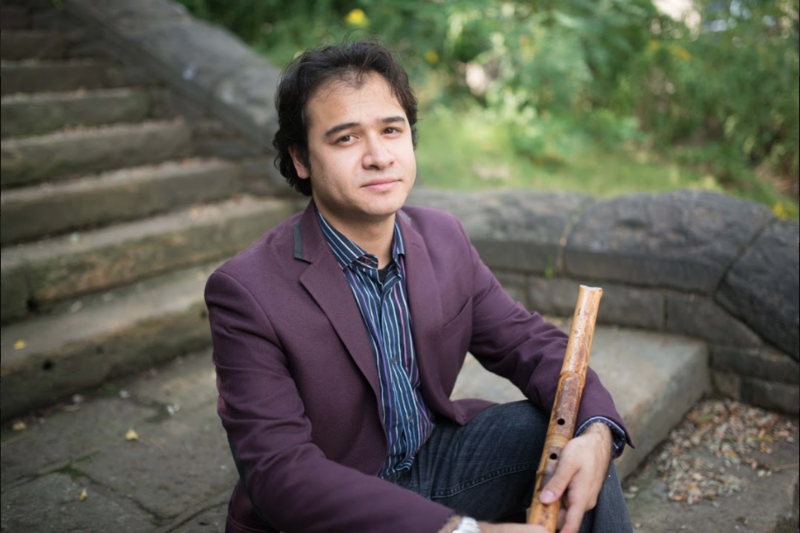 Tipp was one of four Nationality Rooms Scholarship winners from the Department of Music and spent his summer in Japan studying contemporary music composed for traditional instruments. Tamika Iida will join Tipp on koto. Tipp’s performance and talk will be followed by a screening of Mori, the Artist’s Habitat about the reclusive Japanese painter Morikazu Kumagai, his wife Hideko, and the garden they cherished. The event takes place on Sunday, September 23 at 4 p.m. in Pitt’s Alumni Hall Auditorium (7th Floor of Alumni Hall). Tickets may be purchased online and at the door. Admission is free for University of Pittsburgh students.